What if you were told the eternal battle between good and evil had ended in a most delicious muffin, or that the Jedi and the Sith had resolved all their philosophical disputes and joined forces under one banner? Or what if you were told that scientists had discovered a solar-system in which a moon and a sun were one? That’s essentially what’s happening here: all three. 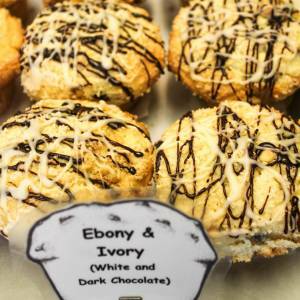 The Ebony & Ivory muffin is duality compromised. Basically it’s like using the Lightside and the Darkside of the Force. And if you haven’t eaten it: Still much to learn you have.